Planting a seed from an apricot will create a tree that produces sweet, tasty fruits you can handpick and eat fresh off the tree in three or four years. Growing an apricot tree from a seed requires some specific conditions, but you can do it at home using a few basic items. For best results, use apricot seeds from trees grown in your area (if possible) to match the soil and climate conditions. Take an apricot pit from a fully ripened piece of fruit. Place the pit in a glass of water and let it soak for one day. Cover the apricot seed with a moist paper towel and put it inside a sealed plastic bag or damp, sterilized sand (enough to cover the seed completely). Put the bag with the apricot seed in a refrigerator that is between 34 and 42 degrees Fahrenheit. Germinating stone fruits, such as apricots, require a “cold treatment,” or “stratification,” period. Leave the apricot in the refrigerator for 30 days. Meanwhile, add peat moss and vermiculite, or good-quality potting soil, to a pot with draining holes. Place the seed in the pot and cover it with more peat moss and vermiculite (or soil). Water the newly planted apricot seed to dampen its surroundings. Keep the pot in a low-lit, warm area. Monitor the apricot seed’s soil condition, which should remain moist for germination. Water the soil when required. 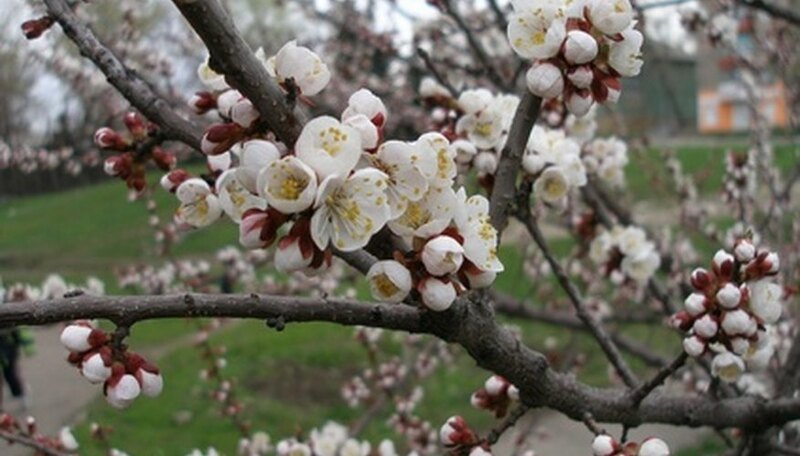 Allow the apricot seed to sprout, which could occur at between a week and a few months. Move the pot to a location that gets indirect sunlight. Continue to water the apricot seedling as needed when the top 1-in. of the soil is dry. Apply basic fertilizer (or houseplant fertilizer) to it as directed on label. Keep the growing apricot tree inside until the last chance of frost passes. Then, move the pot outside for a month or longer to allow the apricot tree to develop further before transplanting it into a larger pot or the ground.